~To Loving Homes Only~~Precious Pebble Pets~Ordinary rocks transformed into unique pieces of art! 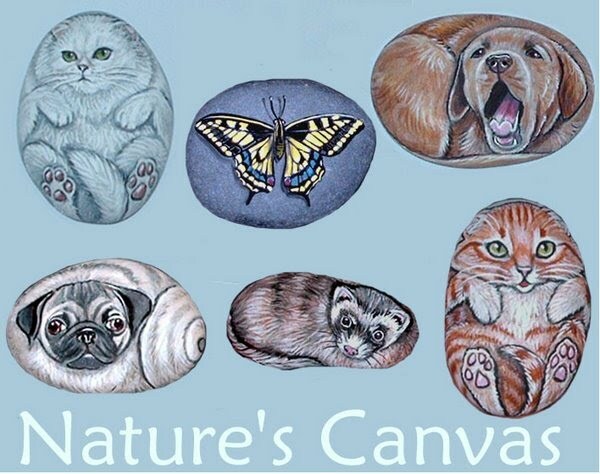 An original, hand painted rock portrait is a beautiful and unique way to celebrate a cherished pet or remember one in a special painting that will last a lifetime. Your one-of-a-kind pet portrait will measure approx. 2" - 2 1/2" and is sealed with a protective finish. The time frame for completion will be approximately 1 week. I request (via email) clear, close-up pictures (face & body) and any pertinent information about the subject. The quality of my painting relies on the quality of the images I have to work with. Please email me with any questions. Owners Comments -"My friend just gave me a rock painting you made of my dog Rocky. I love it!!! Painting on ROCKS?They're like potato chips ....you just can't have one!These natural stone paintings have such a tangible, accessible quality. I like holding it, looking at it from different angles. I like the uniqueness and unexpected quality of transforming such a natural surface into a realistic, three dimensional painting.